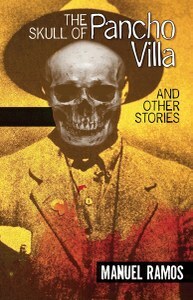 The Skull of Pancho Villa and Other Stories is the first collection of short fiction from the Denver-based writer Manuel Ramos, often called the “Godfather of Chicano Noir.” Their settings range from El Paso to rural Colorado and the megalopolis of Los Angeles, and from the Mexican Revolution to the 1950s and the present. The mostly Chicano characters include lawyers, veterans and a prostitute, with a guest appearance by Jack Kerouac. Written between 1986 and 2014, the stories reflect the stylistic development of Ramos, author of the Edgar Award-nominated The Ballad of Rocky Ruiz, among other acclaimed crime novels. General Pancho Villa leads his troops during the Battle of Ojinaga in 1914, which was filmed for the movie The Life of General Villa. The film included scenes of genuine battles from the Mexican Revolution. Villa’s skull was stolen from his grave in 1926. This collection is uneven, but that’s not surprising in a literary retrospective that represents a considerable body of work from its beginning through its coming of age as Ramos becomes a master storyteller. He tells the stories of ordinary people in extraordinary circumstances, their lives often complicated by prejudice, just doing the best they can in los Estados Unidos.